The Grand Prismatic Spring is the world’s third largest and United States‘s largest hot spring measuring 90 meters in width and 50 meters in depth. It expels approximately 560 gallons of water per minute. 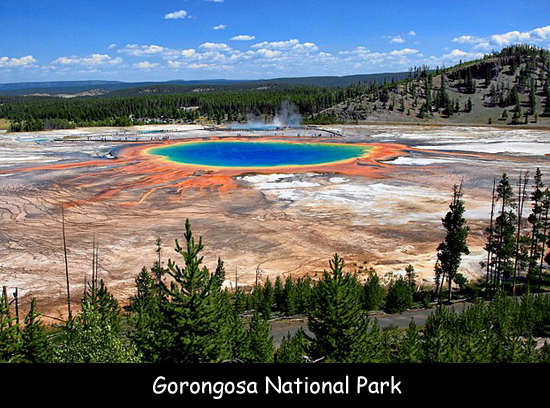 It is located in the Yellowstone National Park and works like other hydrothermal features in the park. This spring was discovered in 1871 by the Hayden Expedition and got its name because of its striking coloration. The Yellowstone National Park is the world’s first national park created on March 1st 1872. A hot spring is formed when heated water flows through the cracks in the earth’s surface. The water moves unobstructed without being blocked by mineral deposits. When the hot water reaches the surface it starts to cool down. After that it sinks and gets replaced by hotter water. The water gets its heat from underground vents as part of the volcanic system beneath the earth’s surface. In the center of the Grand Prismatic Spring pool the temperature of the water reaches 87°C. The water temperature is comparatively lower along the edges of the pool. This hot spring is situated on a bed of rhyolite which is a light-colored volcanic rock having high silica content. The spring has bright bands of orange, yellow and green rings in the deep blue waters. These colors occur because of the presence of the various species of thermophilic bacteria. The colors of the spring start to fade or grow deeper depending on the seasons.